Dr. Griffin is a a board certified dermatologist, dermatologic surgeon, and a recognized expert in the specialty of hair replacement surgery. When other hair transplant surgeons from across North America were surveyed as to who they would want to perform their own hair restoration surgery, Dr. Griffin was among the top five selected surgeons. ENT, dermatological, and cosmetic surgeons from across North America and overseas visit and observe Dr. Griffin’s techniques. In addition to training others, Dr. Griffin gives lectures at national meetings sponsored by The International Society of Hair Restoration Surgery, The American Academy of Dermatology, and the American Academy of Facial Plastic and Reconstructive Surgery. Since 1976, Dr. Griffin has specialized in hair replacement surgery and has devoted his time and resources to improving this specialty. 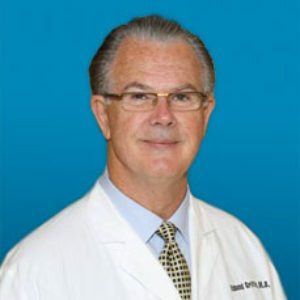 He has been a prominent and active member of the International Society of Hair Restoration Surgeons since its inception. To this day, he regularly attends conferences, workshops, congresses, and forums held throughout the world, and exchanges the latest information on all aspects of continuing education about hair replacement. Dr. Griffin has worked individually with many distinguished physicians including Dadour of Paris, the Ungers of Toronto, Alt of Minnesota, Mayer and Fleming of Beverly Hills, Pitanguy of Rio de Janeiro, Yarborough of New Orleans, Barnett of New York, and Limmer of San Antonio. After growing up in Albany, Georgia, Dr. Griffin completed his B.S. in chemistry at the University of Georgia. He earned his M.D. from the Medical College of Georgia. After interning at the Cleveland Metropolitan General Hospital in Pediatrics, he was commissioned in the U.S. Navy and stationed at Norfolk, Virginia, where he was assigned to a pediatric clinic. This term was followed by three years at the Mary Hitchcock Hospital at Dartmouth College for his residency in dermatology. Dr. Griffin is a diplomate of the American Board of Dermatology and a fellow of the American Academy of Cosmetic Surgery. He is a member of the clinical faculty at Emory University Medical School and on staff at Northside and St. Joseph’s Hospitals. Dr. Griffin is also an active member of the Atlanta Dermatology Association, American Society of Liposuction Surgery, American Society of Laser Medicine and Surgery, Medical Association of Georgia, and the American Medical Association. "Upper mid-level executive with reasonable frontal hair loss for someone in his 40’s. To continue to move up the corporate ladder he felt he needed to try and preserve his look, possibly look a few years more youthful. It was imperative he had an improvement that looked “age appropriate” and it had to be undetectable by his colleagues. Dr. Griffin proposed he simply restore the hair in his frontal area to help. Dr. Griffin stayed within the boundaries of his original hair line in both temples, but he also wanted to enhance the frontal peak to help give the patient more bulk. You can see how much better he looks from 2,038 Follicular Unit Grafts. There is a noticeable improvement in the overall volume of his hair, including a restored hair line with 4,551 follicles. He is ecstatic with the results from the surgery and feels he looks younger than he expected. He is also very pleased with how natural it looks. According to him no one has recognized the significant improvement in his appearance is due to his new hair. He feels he has received more attention as a prospect for advanced opportunities at work. " "A case showcasing the importance of natural, undetectable results. "